As musicians embrace new technological advances, analog and traditional keyboards are getting phased out pretty fast. There has been an overwhelming wave of sophistication when it comes to the music industry. At the same time, even the setup of the musical instrument hasn't been spared by the tide. Also, though some people prefer the original music from the devices, there is the advancement of combining them into one instrument. Other music instruments can be connected in the form of effects in what is called sound creation. Imagine that you can still have drums, guitar, trumpet and other instrument playing together with your keyboard sounds. And this can happen without having a team or a band to play for you other instruments. You can mix these effects, record them and even edit them after a performance. That is the basis within which the MIDI keyboards have been designed; to give the players an advanced shift from the traditional keyboards. This might be thought to be only for a professional pianist. However, the earlier one embraces these advancements, the better. We have therefore embarked on reviewing some of the best MIDI keyboards for a beginner. 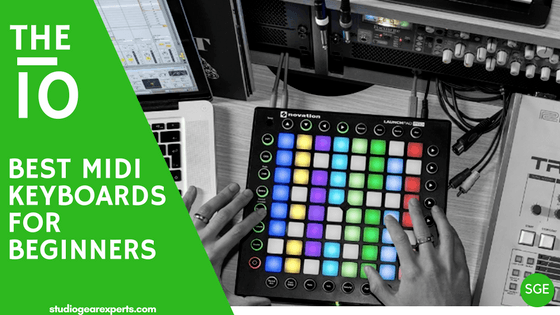 Through the insights in this article, they will be able to know the available MIDI keyboards available for them and their favorability. How much money are you willing to spend? There are different keyboards for different budgets. How complicated is the keyboard to operate? What is the make of the keyboard? How portable is the keyboard? Other than playing my hands on the keys, what else can I do with the keyboard? How versatile is the keyboard? One of the most ordinary things for a beginner is struggling all day without getting the right tunes from the keys. However, this keyboard gives one an experience of inspiration as each of the 61 keys give assuring sounds. They are easy to work on using even inexperienced and less flexible knuckles. It has very sensitive pads for quick and accurate sound responses. You will, therefore, not need to exert a lot of force to make them give you excellent sound. Another amazing thing is that this keyboard doesn't just respond to keys pecking. It also functions like a full DAW providing you with a wide range of creative sounds. It is installed with music creation software making it easy to play different types of songs as you sing along. It is, therefore, a good keyboard for songwriters. In addition to the MIDI output connectivity, it has a USB connection support which makes it compatible with different instruments and inputs. To keep up with the rhythm, which is usually a challenge with wannabe pianist, it has a sustain pedal. It connected to the keyboard and usually controlled with the feet for easy rhythm monitoring. This clutch makes it possible to control the hands-on activities on the keyboard as well as the rhythm of the songs. The only fair way to describe this keyboard is playable and straightforward. It is finger friendly and has no much technology handling needed. Majority of us fear complex equipment. It would be discouraging to buy the right equipment, and then you are unable to use it due to it complicated setup. Novation Launch key is an easy to set keyboard and costs less than $200. You just need to put the power on and plug in the Jack, and the keys give you sounds. The knobs are pads are highly responsive and hence doesn't I've our fingers a hustle. The USB connection makes it very usable with other equipment. It doesn't require any drivers to connect hence almost instant action after plugin. This makes it very versatile and usable for different events. The fact that it is effortless to handle and work on the keys makes it considered a good for armature pianists. Unlike the Arturia keylab which uses the analog software, Novation Launch key use Mac and PC software. It is, therefore, able to be installed with advanced music producing effects and feature. Other features that make this keyboard worth your consideration are the Mixers, inbuilt instruments like drums, effects, and faders. All these ensure that you don't just play sounds play quality sounds. In case you want to carry it to different events or places, it won't give you many hustles. This is because it is considerably lightweight and conveniently portable. if you are looking for one of the best midi keyboard controller for ableton live, this is is our recommendation. The keyboard has a wide range of up to 61 notes. Connectivity limited to MIDI and USB. How creatively you produce or play your tunes, determine how unique you become from the rest of pianists. This keyboard allows you to combine different instruments in a unique way. In that you don't play music; you make music. It is installed with software to allow for swift and accurate integration of other musical instruments. Imagine playing your keyboard while you have creative drums and guitar strings playing together with you. That would be a great feeling. The reality of this is on this keyboard. You don't have to struggle with listening to tunes for control. You can monitor them at the display which is well lit to allow you control your keys. As you go through the creative procedures, you can see your activities hence easier monitoring. Despite having a fewer number of keys, they are highly responsive to touches and therefore easy to play and control. With all these quality features, the keyboard is very easy to use. It has a very easy to follow manual which is placed in the software. This makes it easy to use for people not encountered the keyboard before. In case of unsatisfying performance, you can always edit. You would not want to stay with an unfulfilling performance. This keyboard gives you an opportunity to correct some of the mistakes you could have made. This is due to the midi recording capability supported by the keyboard. As a beginner, you will need to develop skill bit by bit. From simple to professional levels. Novation keyboard gives you a chance to learn and enjoy playing music. It is effortless and conveniently small. It has a total of 25 keys that have an aftertouch effect to allow excellent sound remittance. It is designed to be compatible with the major DAWs so that you remain exposed to a variety of instruments effects. You are served with a rare chance of listening to what you are playing without other people hearing. This is because it has a headphones plugin port. You can, therefore, use it for practice and improving on some skills without other people laughing at your imperfection. Playing keys on this keyboard gives you excellent exposure to different features. You can control various plugins in the DAW. The compatibility to different music apps makes it a better learning platform. To keep up with the current music advancement, it is fitted with software suite with instructions for update and usage. If you're looking for a versatile keyboard that will give you utility for different events and purposes, then you should consider trying M Audio Oxygen. It is very compatible with the computer system making it very much used as an audio workstation. It is readily connectable using the USB port. Unlike like most keyboards for beginners which have a reduced number of keys, this has considerably many keys. All the 49 keys are very sensitive to velocity making them easy to work on your hands and quality sound output. All sound enhancing parts like the knobs and drum pads are equally velocity-sensitive hence a combined excellent performance. It is effortless to use and grow your skills with. Despite being an excellent performer, it is very economical with some of its brands trading at meager prices. It is actually among the best MIDI keyboard under 100$. Its inexpensive price should not be confused with compromised utility; it is very reliable. Whether you are an armature pianist or a professional, MIDI is here with us. The best you can do is embrace it and learn how to use it for quality performances. We have highlighted for some of the MIDI keyboards for you and some of their features. We believe that in the course of reading the article, you will come across one that fits your requirements.